Today I am spending time with my sister and her husband in Colorado! As I watch the news and listen to the stories of the people who don't have family or are affected by the economic crisis, I realize how thankful I am today! God has truly blessed me with His presence in my life! My kids and family are healthy! I have a home that is safe and warm! I have friends who love me! I am so Thankful for everything in my life! "Hi ladies. I was nominated for the Encouraged Blogger Award. I don't know who started it. But what a great idea. I am nominating each of you because I am inspired and encouraged by your blogs. I follow your blogs regularly and I want others to know about your blogs and be inspired as well. " Melisa made my day! I am so glad that my creations can encourage another person! Click here to view Melisa's blog! She has an amazing Thanksgiving centerpiece that is so super cute! Thank you to all the girls who give my inspiration! Hope everyone has a great Thanksgiving day! Be safe and eat lots of Turkey! 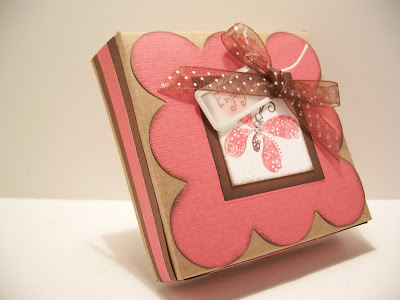 Here is another box I made using TAC set Give Thanks! I love coloring that pumpkin! 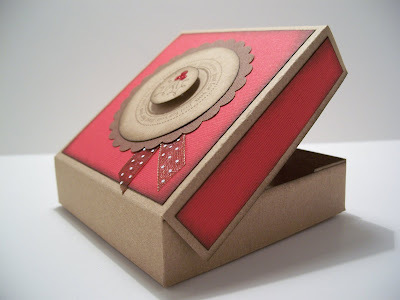 I thought this would be a great box to sit at each place setting at Thanksgiving! My Grandma used to sit something small at each place and I thought maybe this could be a part of her tradition that I can carry on! Fill it with Candy or a big cookie? Possibilities are endless! One of my Angel friends, Stacy, posted a Thanksgiving Challenge! 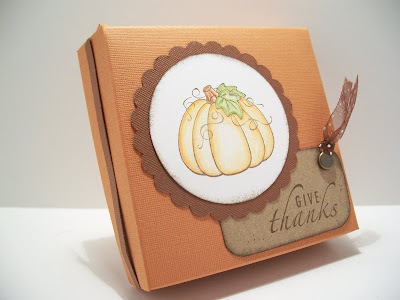 Below are the links to other blogs with Thanksgiving projects! Thanks for the challenge Stacy!! I am still here! Just so super busy! I had made one before that I really liked but I hadn't made any others yet. And then I made the one for Dana's party! This is the one I love the most! 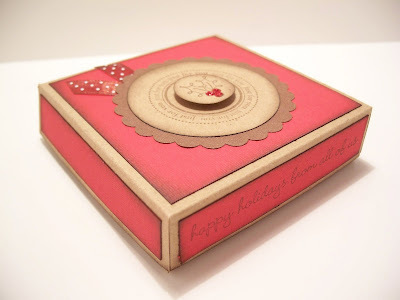 I used Kraft paper, Red Bazzil and Brown CS. 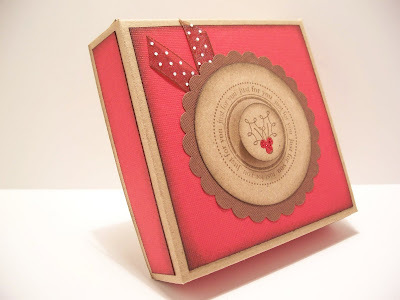 I just love love love Kraft paper! I always buy Hobby Lobby's Kraft Paper. (Thank you Jennifer McGuire for that great find!) It is 25 sheets for $3.99 but when paper packs are 1/2 off......it is only $2!! So anyway....my other favorite is RED! And with Kraft and red and brown combined, you have a super cute combination! I thought my box turned out pretty cute! 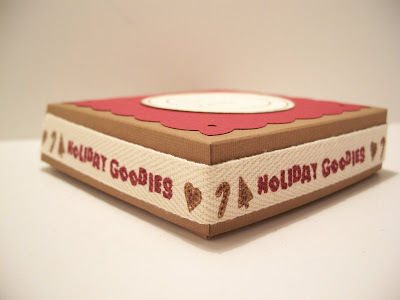 The Christmas Circles and the Sweet Goodies set make the cutest tags! 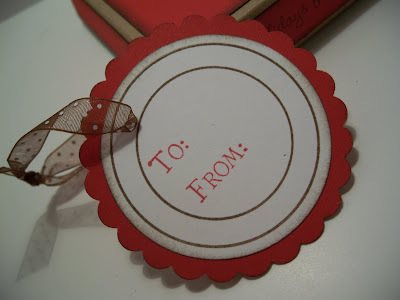 Add the Marvy punches and you have easy tags for your Christmas gifts, goodies or even handmade Christmas ornaments! Thanks Dana, for having a party and picking the boxes! 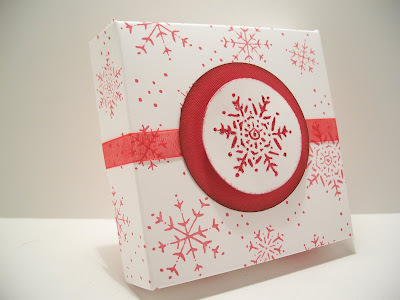 They are soooo easy and the tutorial and idea I got from the Scor-Pal website!! Click here for the link! And here is the tag we made for her party too! So easy! 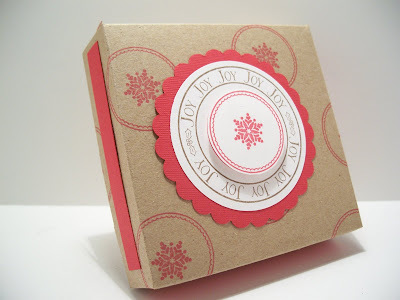 This time the challenge was to use Joy of Christmas or Holly Swirls. So, I chose Joy of Christmas! 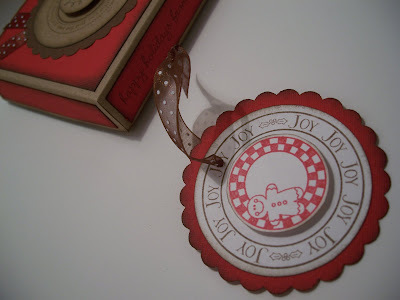 I tried to keep it very simple, although I did do some embossing with silver powder on the ornament. I also cut the ornament hanger off and just put that by the bow! 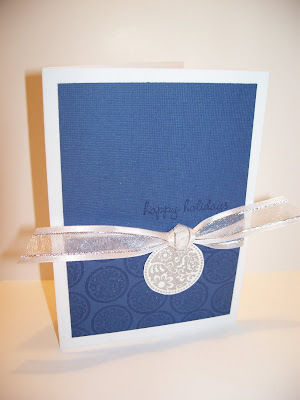 I used Veramark to stamp the small circle on the bottom of the blue cardstock. 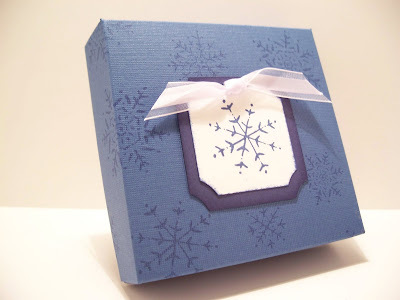 For happy holidays, I used the Holiday Liners set, masked off most of the sentiment and just stamped the happy holidays part on the card!